This six bedroom home is ideal for large families to get away and explore the beautiful north woods. Big House in the Big Woods is a spacious, immaculately maintained home located on a large lot in Minnesota's beautiful north woods! Located in Colvill, a small community located between Grand Marais and Hovland, MN, this home sits on a large lot with no visible neighbors. Just you, your friends and family, large trees, and the occasional wildlife. Big House in the Big Woods is centrally located between several state parks and has easy access to snowmobile trails, making it the ideal location for every season. Big House in the Big Woods has six bedrooms and three and a half bathrooms, making it one of the largest available through Cascade Vacation Rentals. There are plenty of rooms and beds for a large family, multi-family groups, or a friend's retreat. You will love the dining room area that has seating for 8 and room for 4 more at the counter, so the whole group can dine together. Or step out onto the large deck and sit around the fire table while grilling up some ribs on the gas grill. The large, maintained yard is perfect for playing yard games or throwing a ball. The real highlight of this beautiful home, however, is the indoor movie theater which boasts a 5-foot by 9-foot screen, HD Smart Projector and surround sound system. Dim the lights, grab a seat in the oversized chair with a bowl of popcorn, and enjoy a family movie in style! Pick from the extensive DVD collection or find a movie on Netflix. Kids and adults alike will love this feature! 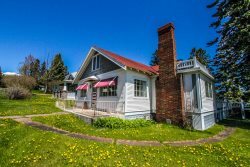 The location up the shore from Grand Marais means you have ample amounts of privacy but are also close to everything the North Shore has to offer. Miles of hiking, biking, snowmobiling, and cross-country ski trails are just a short drive away. Several state parks are also easy to access from this home, including Judge CR Magney State Park, which has the famous Devils Kettle Waterfall. Head on into Grand Marais and do some shopping at the unique ma and pa shops that make the area so unique. No chain stores here! The restaurants are also one of a kind! In addition, you can head up the shore to Grand Portage Lodge and Casino or the Grand Portage National Monument. The Pigeon River Falls span the border between the US and Canada and are a popular hike. Whatever it is you want to do during your Northland vacation, Big House in the Big Woods is a great base camp for whatever your trip may bring. Pet-Friendly Note: This property is pet-friendly and allows non-shedding dogs only. Please do not book this property if you have a dog that sheds. If the property is found to have pet hair upon departure there is an additional cleaning charge that will be applied to your reservation. Please contact our office at 218-663-7971 if you have a question about the pet policy for this home. Road to Property is Gravel and Driveway May Be Icy in Winter Season. Everyone at Cascade are helpful and very nice to work with. The house is huge and well kept. It is in a remote area so it's very quite. The movie room was awesome even though we didn't have time to watch anything and couldn't figure out the system either, but they have tons of movies to choose from. I would love to go there in warmer weather to enjoy the nice deck.